When the grains on the Ifugao Rice Terraces in the Phillipines turn from green to yellow, not only is it a time to harvest, but also an opportunity to celebrate the end of the growing season. The growing season prohibits the local indigenous communities from eating (shell)fish from the river and leafy vegetables, or performing heavy manual tasks like working in the terraces. Thus, the lifting of these prohibitions is cause for a festive mood and rituals which pay respect to the gifts of nature. Collectively, the three harvesting rituals performed during the Rice harvest festival are called huowah. Punnuk is the last of these rituals and it involves different groups of men, women and children tugging at a long stick in the strong nearby river current. It is game which involves a lot of cheering and laughter and ridicule, convinced that the winners would have a bountiful rice harvest throughout the year. At the same time, it pays respect to the deity from the East, called Binongbong, who is a believed to be responsible for the end of the growing season. 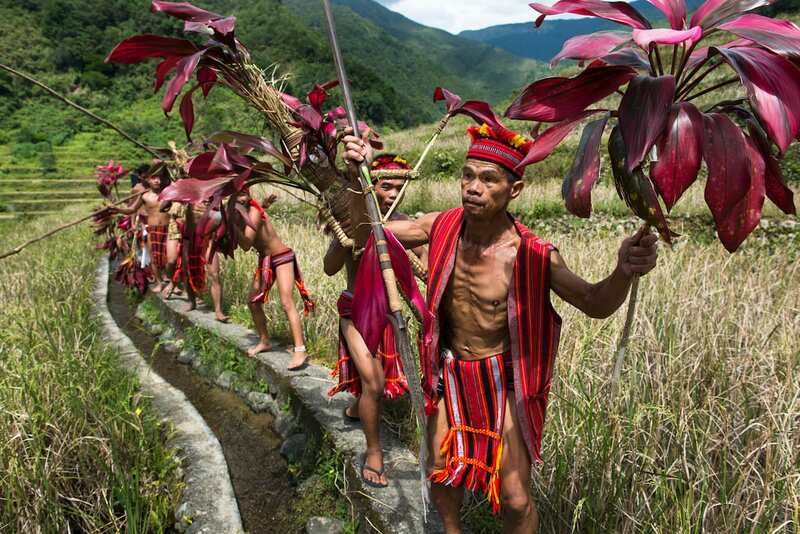 To pay respect, the indigenous Hapao, Baang and Nungulunan dress their best, the men in vibrant loincloths and formidable headdress, the women in their native skirts. On the day of the punnuk, the three different groups come from three different directions making their way to the river through embankments in the rice terraces, making for a colorful and cheerful scene of red against a lusciously green background. The men carry the sticks, decorated with waving bunches of dong-a leaves. Meanwhile, the playful exchange of taunts increases as their tug-of-war draws near. During the ritual, bystanders of the two teams competing, chant songs and prayers which implore the gods’ blessing for a successful performance of the rite and for the community’s health and wellbeing. After the matches and a winner is declared, the used kina-ag is thrown into the river to be swept away by the currents so that when it seen by the communities living downstream, people will know that the harvest in Hapao, Baang, and Nungulunan has been completed. Also, a monkey-like scarecrow figure made of rice stalks is thrown into the river, symbolizing that all misfortunes, pests and sickness will be washed away.